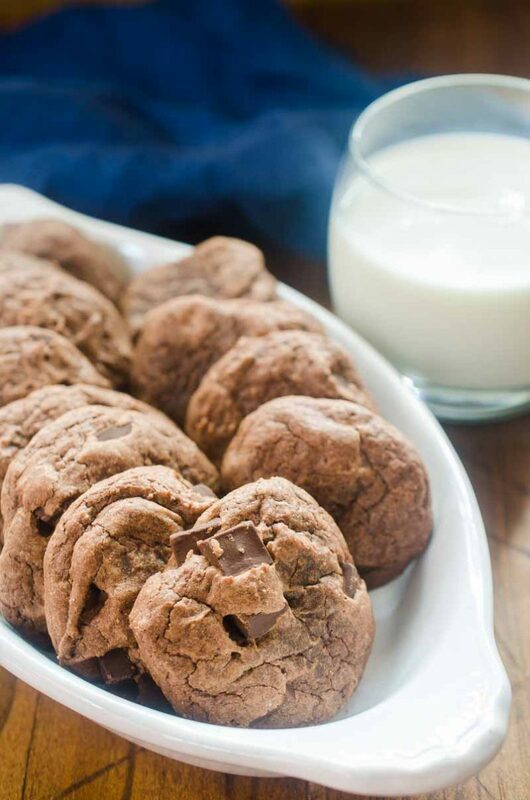 Brownie Mix Cookies are a delicious combination of two easy dessert recipes; brownies and cookies! 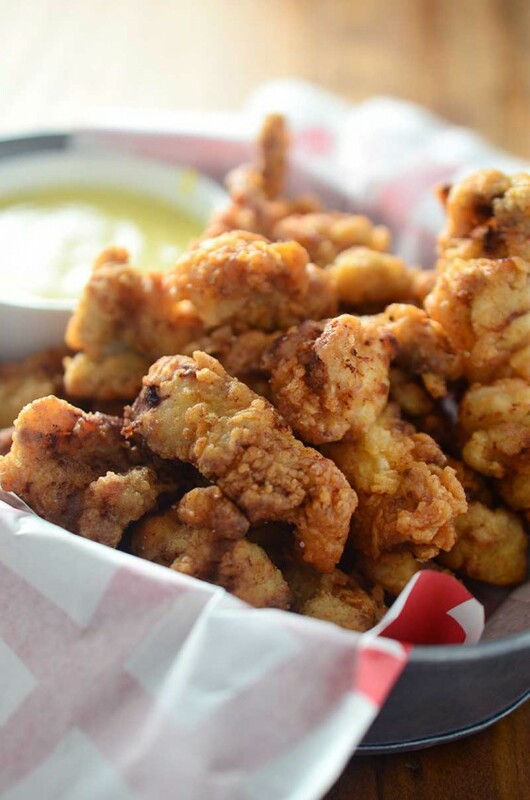 They come together in a snap and are always a crowd pleaser. 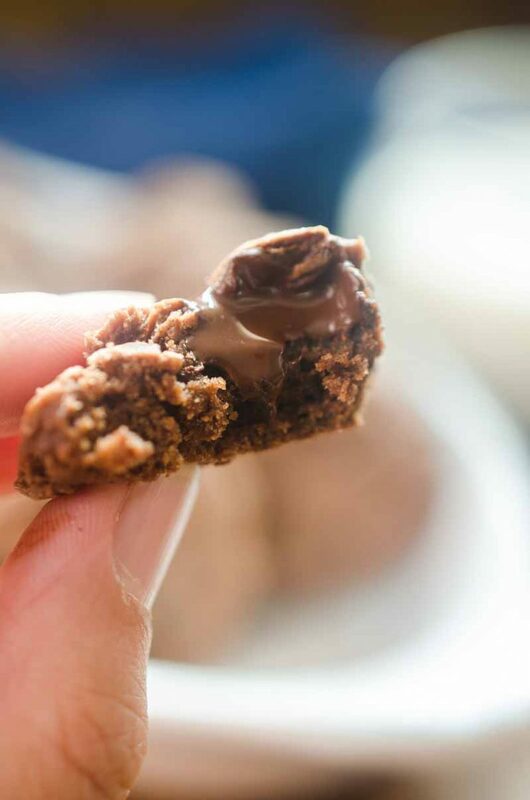 Brownie Mix Cookies. You guys, these are my favorite cookies of all time. I am a sucker for brownies. If I had to pick a favorite dessert of all time brownies would be at the top. It’s probably because of all that chocolaty goodness. Cookies would come in at a close second. So I figured why not put them together? And how about I throw in some dark chocolate chunks for good measure? The cookies are slightly flaky on the outside, gooey and fudgy on the inside. AKA: The perfect chocolate lover’s dessert fix. I mean seriously, just look at that melty chocolaty inside. What else can you do with brownie mix? Being a blogger and recipe developer, I will, most of the time make everything from scratch. I even make my own Hot Oil and Pasta. But sometimes, it’s nice to have premade mixes on hand. Especially when you’re in a pinch. Since this was kind of a spur of the moment thing, I didn’t have all of the necessary ingredients to make brownie batter from scratch, so I used a box brownie mix (gasp!) that I had on hand to help me. I think that it worked perfectly and saved me a trip to the grocery store. 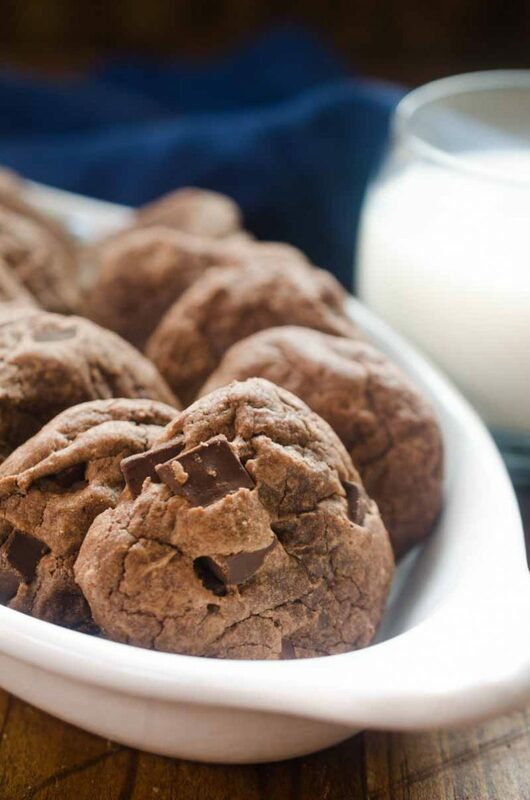 Do you need to chill brownie mix cookies? When I originally wrote this recipe way back in 2009, I had included a chill time of 2 hours. I originally included those instructions because I find that it does make the batter a little bit easier to work with. That being said, when I have found it a little hard to wait, I omit the chilling time. The batter is a little stickier but the finished product is the same. Can I freeze brownie cookie dough? Yes! Freezing cooke dough is a great way to have cookies around whenever you want. 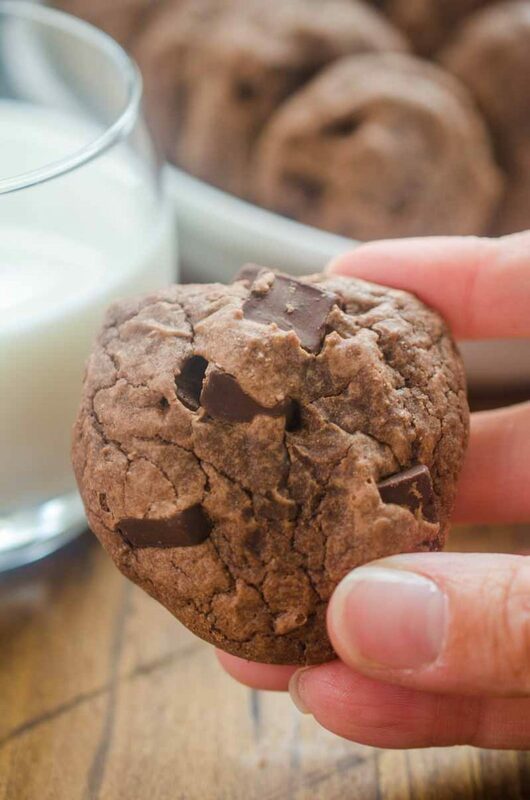 These dough for these brownie cookies is perfect to freeze because they are hearty enough to handle the freezer. To freeze the cookie dough, roll heaping tablespoonfuls of the dough into balls. Place them in a single layer on a cookie sheet and freeze until firm. Once they are frozen, you can place them in ziplock bags. By freezing them individually, it prevents them from sticking together and you can grab as many as you’d like when you’re ready to cook them. The dough can be frozen for up to 3 months. When you are ready to cook them simply remove them from the freezer and preheat your oven. You might need to cook them for a little longer, maybe 12 minutes. If you want to learn more about which cookie doughs are good to freeze. Sally from Sally’s Baking Addiction put together an extensive post on how to freeze cookie dough. If you are looking for even more indulgence, you should give this Fudgy Brownie Cookie Ice Cream Sandwich a whirl. Note: this post was originally published in 2009. Updated with video and new photos in 2018. Whisk together flour, brownie mix and brown sugar. Using a heavy spoon, stir in eggs one at a time. Followed by butter and 2 tablespoons water. If the batter appears like there is too much flour add 1 more tablespoon of water. Batter will be very thick. Drop heaping tablespoons of dough on the cookie sheet, you want pretty thick cookies here to get the brownie feel, about 3 inches apart. Press down slightly. Don't flatten completely. Bake for 8-10 minutes. Remove from oven, allow to cool 2 minutes on cookie sheet. Transfer to cooling rack to cool completely. Hi Leslie, I listed butter but used unsalted because that is usually what I have on hand. I have also used salted butter. The difference is not noticeable so any butter will do. I mentioned in the blog post that when I posted this recipe in 2009, I originally chilled the dough for two hours. I omitted that from the updated version because I didn’t think it was required. You can certainly chill the dough if you want though! Hope this helps! This is the ultimate for every chocolate lover! Seriously, these look absolutely incredible! I have to get a big batch of these going! Looks so good! Great idea! These look like lovely little cookies. Mmmm, those do look good and so easy! This is my dream dessert! Love that you added chocolate chunks to this! You can never have too much chocolate! I want to eat them all, lol! 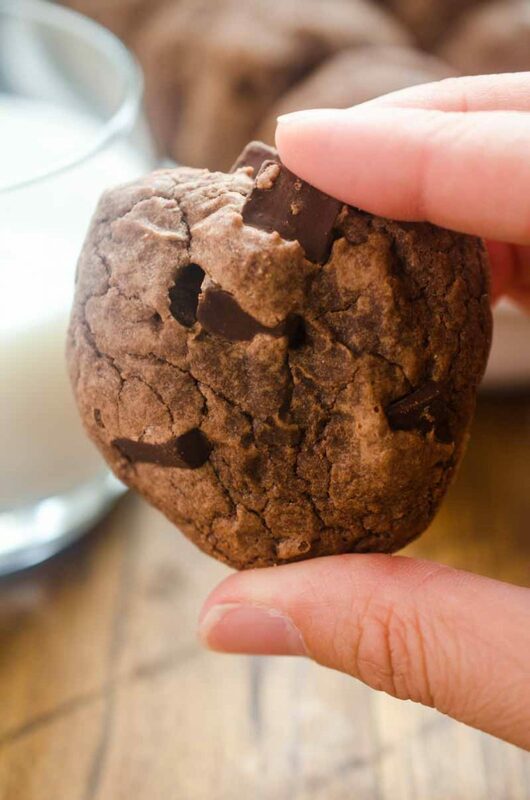 I love brownies so I know this cookie is right up my alley! Oh my these look amazing! Perfect dessert! jbn130100- you could use either. I used light. Hi Akanksha- I have never tried to make these without brownie mix before so I am not sure how it would work. You could try mixing the dry ingredients for a batch of brownies as a substitute for the brownie mix.Then follow the recipe as written so you’ll be adding more flour and brown sugar. Again I haven’t tried making them that way so I can’t say how well it will work. Hi I wanted to know can we do this without the brownie mix… if yes what can be the substitute. These were SO yummy! I bought a mix that already had chocolate chips in it to save some money and added in some white chocolate chips that I had leftover from another recipe. The fudgy deliciousness was out of control! can i use milk chocolate instead of dark chocolate? Fudgy Brownie Yum! Looks delicious! In the fridge now. After I stirred the dough with all of the ingredients (minus chocolate chips) I used my hands to work in all of the ingredients. Definitely got it molded better together better than my spoon ever would have! I used a ” danish dough wisk ” which can be found on amazon. Good to know! Thank you! Hi there! 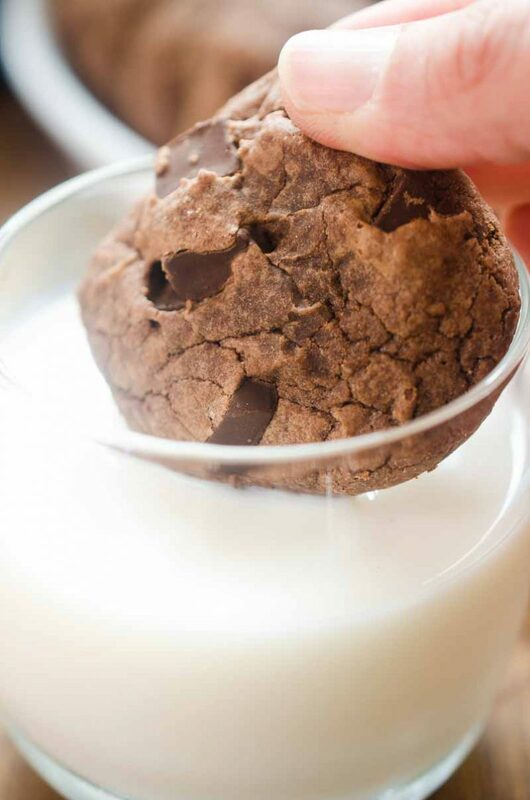 I was looking for a great brownie cookie recipe and came across yours. I’ve tried others that are from scratch – I don’t normally use boxed mixes. I must say, they are phenomenal! You nailed it! Easy enough for the kids to make too. I only chilled mine for about an hour and they still came out great! Thank you Thank you! what if you don’t refrigerated for the full two hours? I was wondering, are you using butter unsalted or salted or could I use margarine instead? These look amazing and i cant wait to try them out this week! Hi Tierra, I used unsalted butter in this recipe. I haven’t tried them with margarine so I can’t say whether or not it would work. Let me know how you like the cookies! I’m making my holiday cookies and happened across your recipe when looking for fudge brownie cookies. They turned out great! I didn’t have chocolate chunks on hand so I used the peanut butter and chocolate chip mix I did have. Thanks for sharing! Merry Christmas! waw .thaaaaaaaanks alot for this delicious cookies .I just made them . Thank you for your quick response. I will check out how to freeze cookies and will give it a try! I would like to make these and freeze them for about a week before a party that I am having. Will they still be good after freezing? Thanks for any help you can give me! Hi Pat! I have never tried freezing these before so I can’t say for sure if it would work out. However, I don’t see why it wouldn’t. I did a search and found some tips on allrecipes for you http://allrecipes.com/HowTo/freezing-cookies-and-cookie-dough/detail.aspx. That might help! Hope you enjoy the cookies! Hey, your article is good. I found it on Google. I think i will come back one day. These look great! Just curious — will it hurt anything if I leave them in the refrigerator longer than 2 hours? Jessica- No I don’t think it will hurt anything. My worry is leaving them less than two hours because you want the dough to be pretty firm. Hi Cheryl, Betty Crocker’s Fudge Brownie mix should work just fine. Hope you enjoy them! i would love to make these but i dont like using box mixes… could i make these without using it? if so what kind of brownie recipe would work?? Made these cookies last night and they were amaaaazing! Definitely making them again. Thanks for the recipe!!! love the look and sound of these, but I don’t have brownie mix on hand… is there anything in brownie mix other than flour, cocoa powder, sugar, and baking soda? I might try borrowing those ingredients from a brownie recipe and see if I can make these. I’m checking my pantry right now to see if I have everything for these, lol. Brenda- haha I do know what happens when you assume :) However, I’m not sure. I dont have much experience cooking in high-altitude. I would think that the high-altitude instructions would work though. Please let me know how they turn out! Those look amazing. My husband is addicted to brownies, and his birthday is coming up soon, so these would be perfect. Thanks! I love making these cookies! They are my family’s favorite cookies. They are delicious, fudgy, chocolately and just all around wonderful. I use the brownie mix that has chocolate chunks in it and them don’t add chocolate chips and they turn out perfectly. WOW theses are GREAT!!! I made them around the holidays & the family keeps requesting them! how can I get the gluten free version? I don’t know how to contect her. My son would love to eat this. Wonderful! I just made these and they are soooo good! I used Pillsbury Milk Chocolate Brownie mix and milk chocolate chunks so thatthe cooies didn’t come out too rich for the kids and they are excellent! What heavenly little treats these are! A chocoholic’s dream. I was wondering how to get the gluten free version of this that Chanda made. I don’t know how to contact her to get the recipe. My kids would love to be able to eat this. hey everyone just tried the cookies and they are just as good as the picture. the first time i made them i did them according to the recipe but this last time i came up with a way to do them gluten free by scratch and with the gluten free brownie mix so if any of you would like to know the changes made to make these yummy cookies for those of us that cant have the good ole stuff let me know and i wll be happy to share. I’m baking for my son, Joseph’s class Christmas party.They’re going to gobble these delicious cookies right up. Thanks a million! These cookies look awesome! I am wondering if anyone has ever put them in the freezer; would that mess with the texture?? Hi Denise! Thanks! I have not personally put this cookie dough before in the freezer, but since it is a heavy dough, as opposed to one made with egg whites, it should freeze quite well. Just make sure to protect the dough with a couple of layers of plastic wrap and allow plenty of time to thaw before cooking and cook within 4-6 weeks. I would also think that freezing the cookies after you bake them would not really mess with the texture, but again I have not done it personally. I made these and they came out like little cakes. I threw them out :[ They looked so good im not sure what I did wrong. D: I am sorry to hear that. I was wondering what exactly do you mean they came out like little cakes? Were they too puffy? Too dry? Not fudgy? If I know I might be able to make some better suggestions. My first thought when you said “cakes” was about the butter you used. Did you use real butter? Thanks! I thought this was a great recipe for my daughter to try making cookies for the first time. She had so much fun…and was only mildly annoyed at me for taking pictures. :) Thanks for the recipe!! Hello Deseree! Thanks so much for this recipe – I tried them with peanut butter chips intead of the dark chocolate chunks and they’re delicious! You’re welcome Christine! I will definitely have to try adding peanut butter chips next time, there is nothing quite like the combination of chocolate and peanut butter. Thanks for the tip! Erin, I’m glad you and your family love them but am sorry to hear that you’ve had problems with them being too flat. I am not sure that using a different brand of brownie mix would cause the problem as a few other people have left comments saying that they used other mixes and didn’t have a problem. One thought may be that the batter is getting to warm, make sure it stays cold. I would try putting the bowl in the fridge while you are baking the batches. I would also wait for your cookie sheet to cool down, if it is too warm the batter will spread. Also over working it could cause this problem. Also if you’re at a high altitude you’d have to adjust for that. I hope this helps! 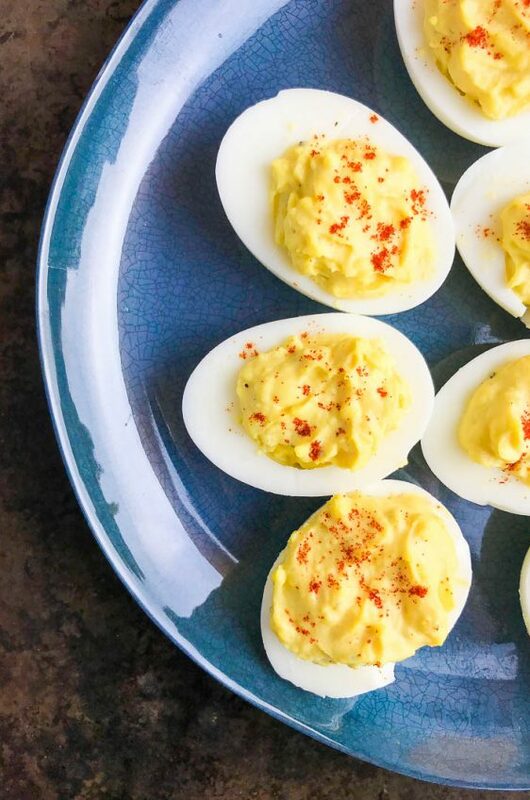 Deseree, I’ve made these a few times and my family and I really love them. The only thing is that they never quite come out as thick as they do in the picture, but rather flat and soupy when I take them out of the oven. I follow all the directions, but use a different brand of brownie mix. Could this be the problem? Any idea what I could be doing wrong? These cookies are amazing! I have a new favorite cookie among my family, and as the family cookie master I say these cookies are among the best and the simplest I have ever made!! Thank you so much! You’re welcome Maegen! Thank you for the nice comments about these cookies, I am glad you and your family liked them so much. Wow, the middle looks fantastic, thanks for sharing! I made these today–absolutely wonderful. Instead of adding chocolate chunks I used ghirardelli brownie mix, which contains an abundance of chocolate chips in it–worked really well. Great recipe, will definitely end up making them again. girl, i baked those cookies over the weekend.i had some friends over with their families. i think the mistake i made was breaking a cookie in pieces and giving everyone to taste. 2 of the boys that were there raided the tray. 1 of the families took home the rest. i only got one. the next time i bake them i need to make sure that i don’t have company. i went back to the grocery store, the other size they have is an 11 ounce, so….i don’t know what the adjustment would be for that but i don’t think the smaller size would work in my house, the recipe is too popular. Hey belle, I’ve made that mistake before too, always gotta hide some for yourself! ;-) I am happy to hear that your family and your company enjoyed these. I just finished making these and tasted one right out of the oven,with a mug of milk. 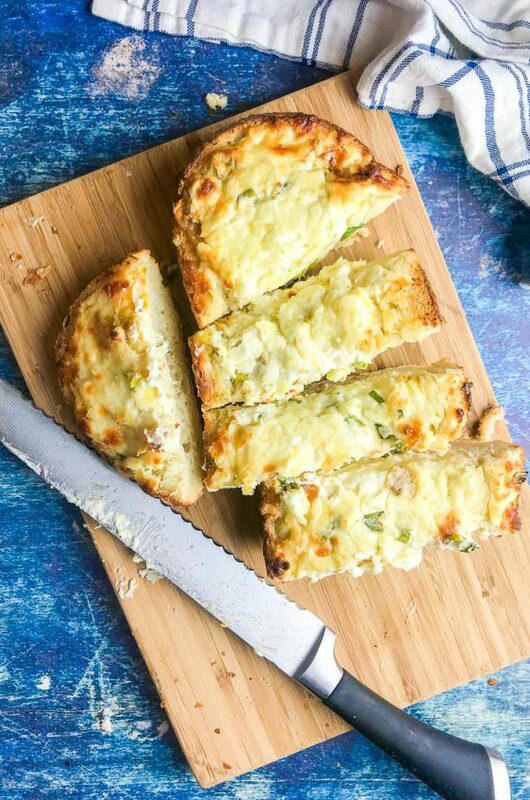 they are wonderful,such a simple recipe even i could make them well! im going to share them with everybody. OK I just got to taste one………….. I am out of millk, which is a bummer, but WOW that is tasty! I convinced my mom to make them just by her seeing the pictures! 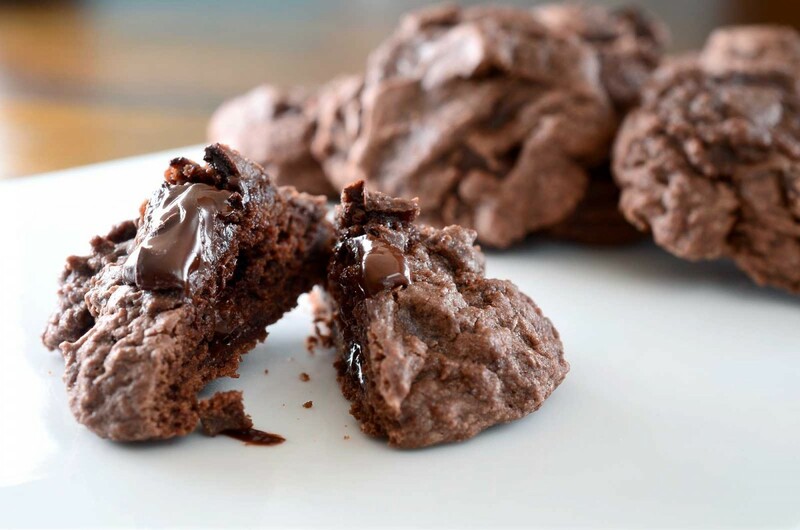 I am glad I used the Duncan Hines Chocolate Lovers Brownie mix, which has the double fudge with the fudge packet… I mixed that in as well, and wow… I will never make another cookie recipe again. the size i used was about that, i think it was 18.7 ounces if i remember correctly….. but the brand i used was betty crocker, i remember picking up the 2 sizes in the grocery. i didn’t know which one to get so i just opted for the bigger one. but the other one was a 11-13 ounce i believe…..but i’m not sure, i can’t remember…. next time i go to the grocery i’ll make a note of it and write you. hey deseree, you made me laugh when you said you are not a sweets fan…lol. but, i have another question for you, there are 2 sizes of brownie mix at my grocery store. 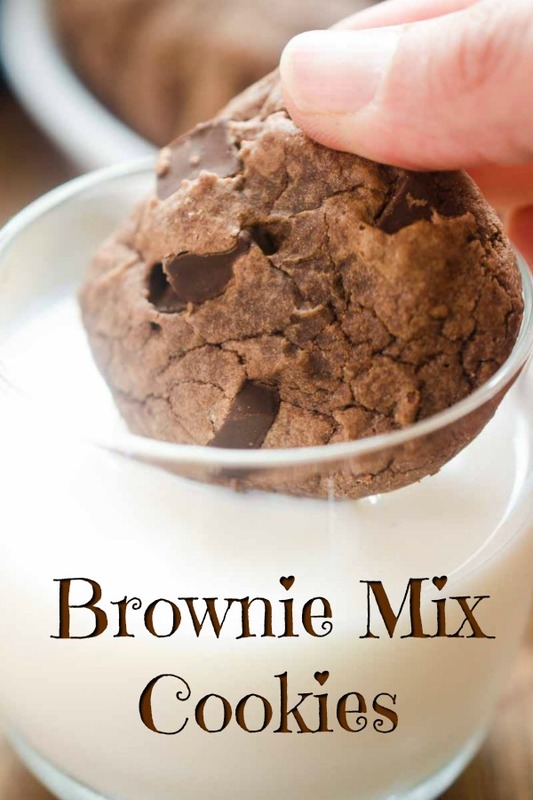 i used the bigger one, but i was wondering if i use the smaller one with the exact same ingredients if i would get the same results….i guess what i am really asking is….does the size pack of the brownie mix that i buy matter? do i have to adjust ingredients to suit? Hey Belle, I think that if you did buy the smaller size package of brownie mix you would want to adjust the other ingredients to suit the change so that you can get the same results. What was the size that you originally used? I used a box of Duncan Hines brownie mix so it was a 19-20 ounce package. CAN’T wait to try this, LITERALLY, what happens if i skip the 2 hours refrigeration? Des, I came upon your site on stumbleupon. It’s really delightful and always brightens my day. Your husband takes beautiful photos of your wonderful creations. Keep doing what you are! Made this the other day and it was amazing! Everybody loved it, even my uncle who doesn’t really like sweets loved it! Thanks! hey deseree, i checked out some brownie cookie recipes on other websites. i realized you added more sugar, and you used flour, i was wondering if this didn’t make the recipe too sweet? when you figure out how to get the same results from scratch can you post it. i have been looking for one and can’t seem to find it. by the way your cookies look really good, the best i have seen so far! These are seriously sinful looking. YUM. OMG!!! These look sooo good!!! I’m making these tomorrow, I can’t wait!!! how can these be made completely from scratch (i.e., sans brownie mix)? I would love to make this. Memoria: I am not entirely sure because I have never tried to make them without the brownie mix. I might have to do some experimenting! Just made these… delicious! My family loves them! I needed to use a bit extra water 5 tablespoons otherwise the batter was too dry but they they came out perfectly. I also cooked them for 11 minutes… Love this! Thanks for the recipe! WOW! Trying to lose weight but will try for something extra special and worth the calories. Those cookies look fabulous! I was practically licking the screen. I hear that’s not good for the screen, so maybe I’d better just make them. Can’t wait to try them. Thankyou for your time in creating and sharing these gems. YUM! I just took these out of the oven and wasted no time to try one with a cold glass of milk! 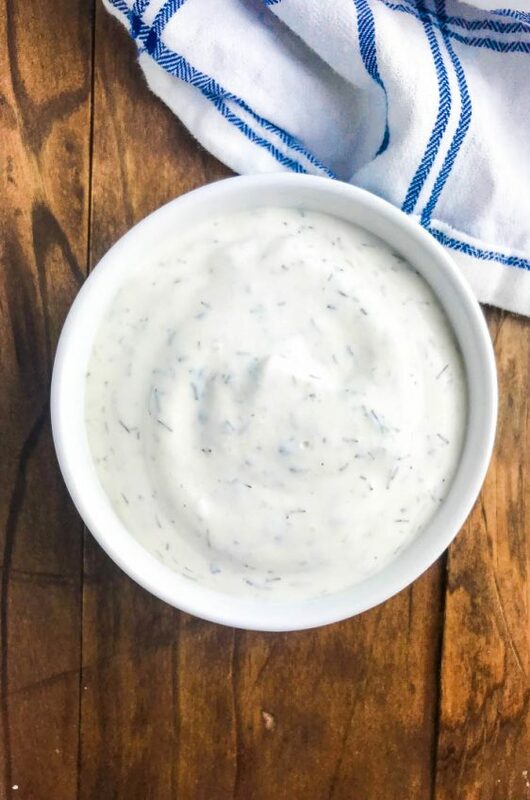 So easy to make and has great results! found this from stumble. WOW looks amazing! Thank you to everyone who commented on these! I hope those of you that try them really enjoy them! Zsa zsa: You can use the photo as long as you credit my blog and link back to me. Thanks! Hello, What is a stick of butter please? Sorry I’m English!! Misspelled url of my blog. haha sorry. anyway, i wish i can taste these yummies! thanks for sharing the recipe! OMG! these look so yummy! can i borrow your photo and post in my blog? Now you have me craving chocolate! 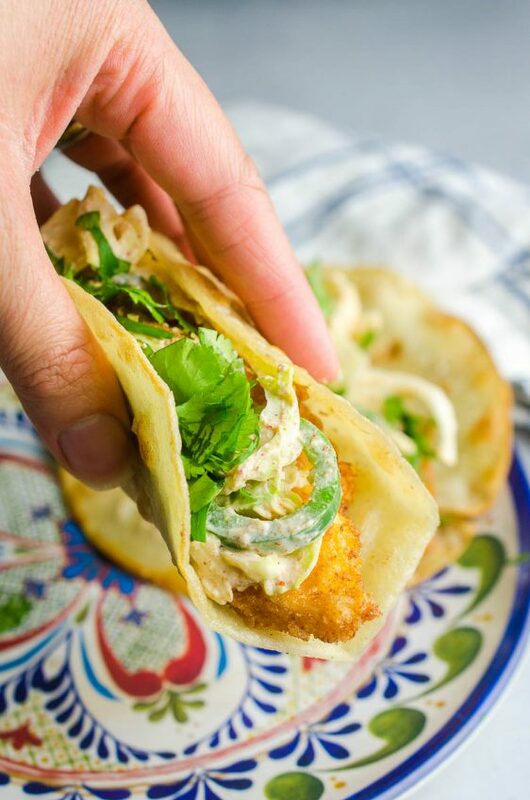 These look awesome and with the mix, quick and easy to make. OMG they look delicious! I’m a big chocolate fan so I love making new things with chocolate and these look particularly melt in the mouth! I reckon these cakes are amazing as I have made them before, but I have forgotten how many grams a stick of butter is. I love anybody who loves these cakes so spread the word, as these cakes have not been given the credit they deserve. So thank all of you people who spend the time to read other people’s and comment on others!!! These sound absolutely amazing, but when it says 1 stick of butter how many grams does it mean? Thank you Carri!!! they sound like nice cookies to eat. Don’t we all crave chocolate all the time, just some of us hate to admit it.. :) These look fabulous! OH MY GOODNESS! We are making these tonight!!! I’ll post them on my blog in a few days and let you know how it goes! yum!!!!!!!!!! Thanks Carri! I hope you find them as delicious as we do! Welcome Marta! Hope you like them! Thanks Cassie ! Let me know how it goes! That sounds like a perfect plan Lynn! Off to the store so I can make these today! Believe you me: I’ll be making these!!! thanks! 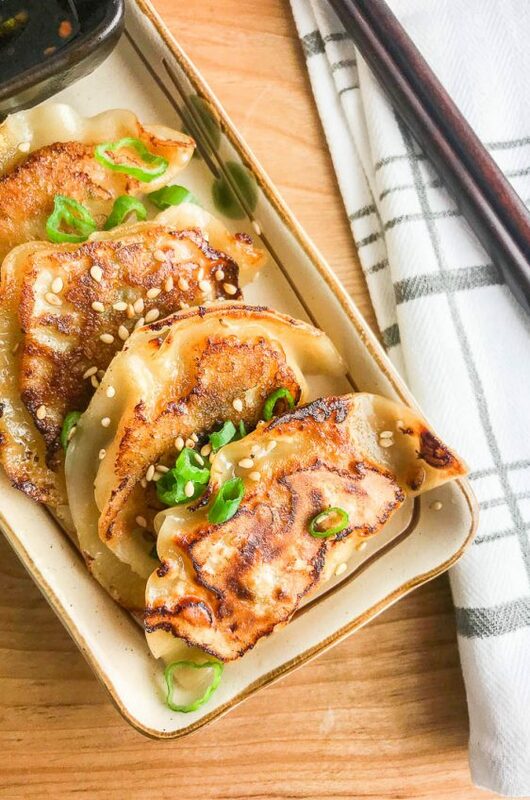 Wow those look amazing! I love chocolate…yum! Copyright © 2008-2018 Life's Ambrosia. All rights reserved.